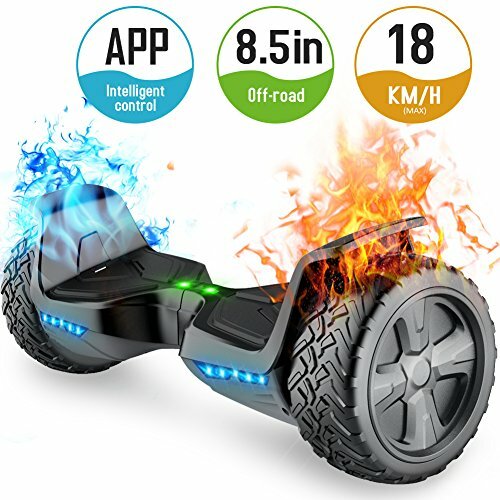 ▶Verified Safety:UL2272 Certified of hoverboard and UL2271 Certified of the battery,comply with all U.S safety regulations,which is with the features of high-temperature resistance and fire resistance. ▶Bluetooth Speaker & RGB LED :8.5 inches large wheels ,awesome RGB LED design with color lights and music, give you a colorful and freely experience. ▶Self-balancing Technology:The first Mechanical Self-Balancing Electric on the Market. Own an invention patent,provide a safety and easy operation to customers. ▶All Terrain Tires & High-standard Quality : Professional gyroscopes,acceleration sensors and motherboard ,give you a smooth and stable riding experience and help you to go wherever you want to go. ▶12 months warranty and 24/7 Service:one year warranty for wheel hub motor, controller and battery, half a year warranty for charger from the date of purchase.Any issue just don’t hesitate to contact us.